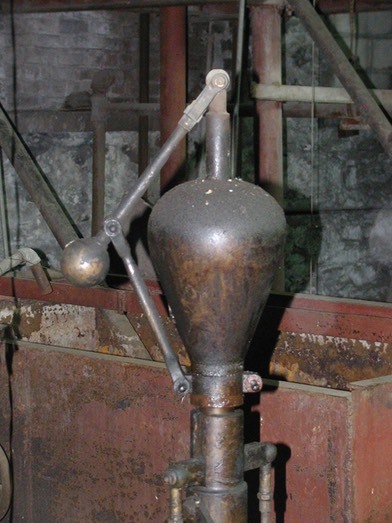 For years, CAMA had been actively looking for an example of the Corliss valve design embodied in a relatively small steam engine. A few years ago the board bid on an engine at auction but the bid soon surpassed the maximum that we were willing to pay. This website had for some time been soliciting the general public for such an engine in our "Seaching the World" page. 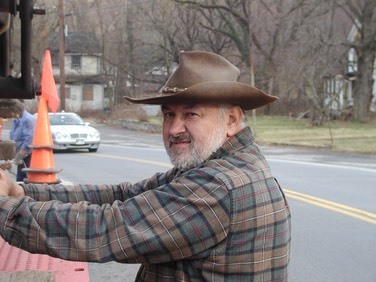 In October of 2006, we received an email from one of our New York members, Todd J. Syska. 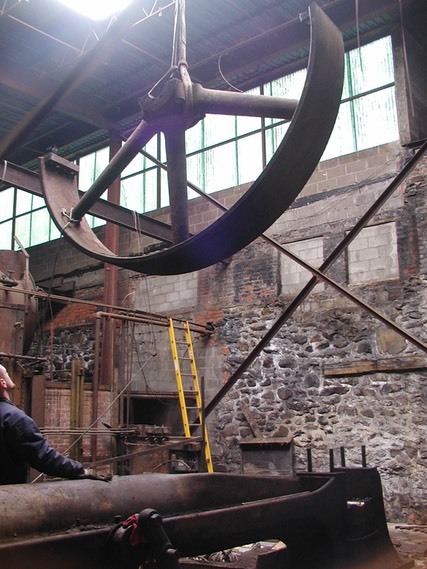 Todd was doing an environmental survey at the Lafayette Paper Mill located south of Newburgh, NY. He was being escorted by Andy Sanchez, an employee of Cactus Resorts Properties of Scottsdale, AZ the current owner of the mill property. Andy had for some time been searching for someone who would be interested in an antique steam engine located on the site. Somehow, Todd and Andy got on the subject, and Andy showed him the engine. Todd knew the significance of this engine and emailed CAMA at this website with the information. Within a week a survey team consisting of Ray deZara, Trevor Marshall, Jim Anderson and Todd was escorted by Andy to view the engine. 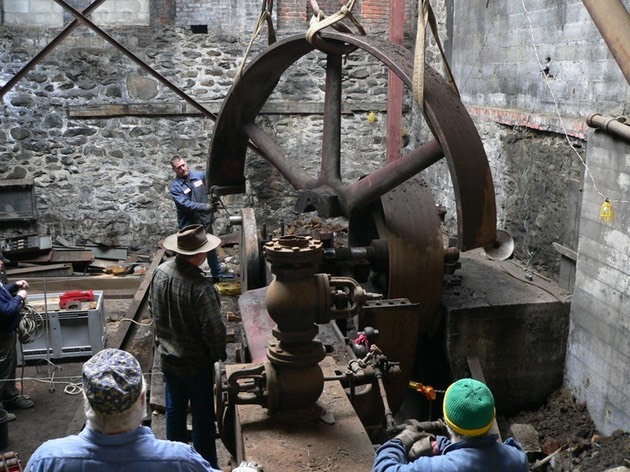 The engine in question is a Nagle-Corliss built around the turn of the century in Erie, PA. 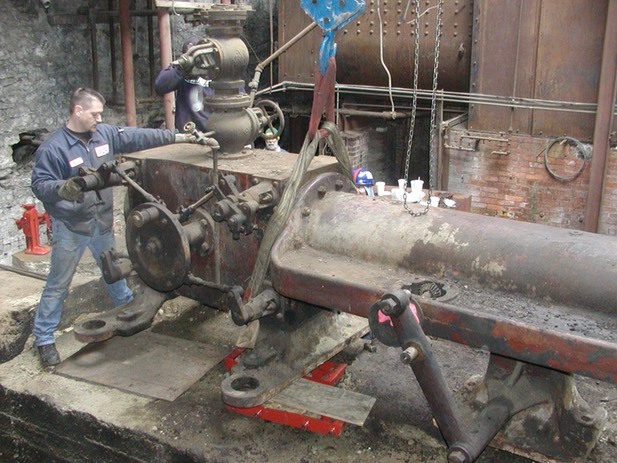 The owners were generously willing to donate this engine to CAMA if we could get it out of the mill. This is the story of the retrieval of this engine. 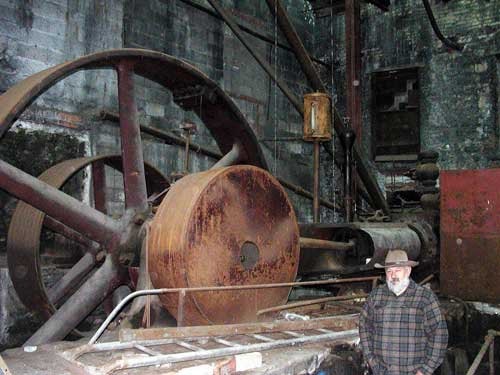 Todd J. Syska next to the Nagle-Corliss steam engine. This engine has a 12' flywheel and a 6' drive pulley. It was built around 1910 by the Nagle Engine & Boiler Works of Erie, PA. This engine had not been used in many years and was covered with debris. This is a classic Corliss valve system, with the central disc oscillating back and forth to alternately open and close the inlet and exhaust valves. The engine is double acting meaning that steam is admitted first to one side of the piston and then to the other, so there is a power stroke in both directions of piston travel. 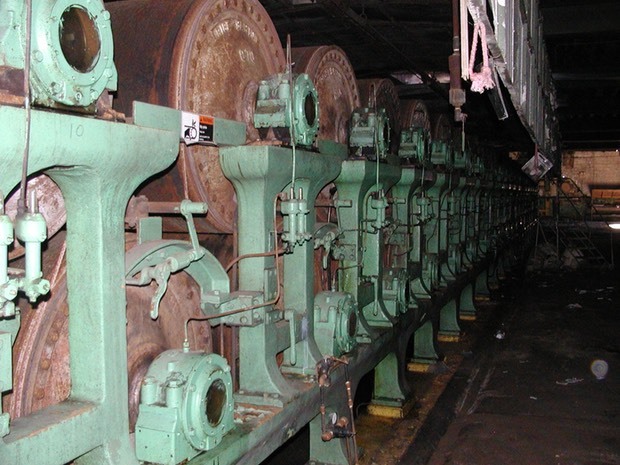 The engine was located in combination boiler room/engine room. There were three boilers next to the engine, two coal-fired and one #6 bunker C-fired. This room is located in the oldest part of the mill. 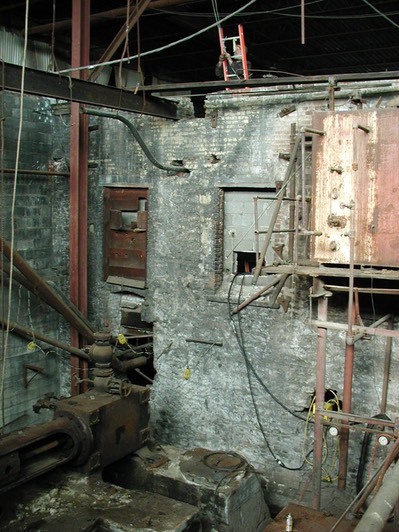 There is evidence that this room was active in the mid-1940s, but, eventually the room was abandoned and bricked off from the rest of the mill. 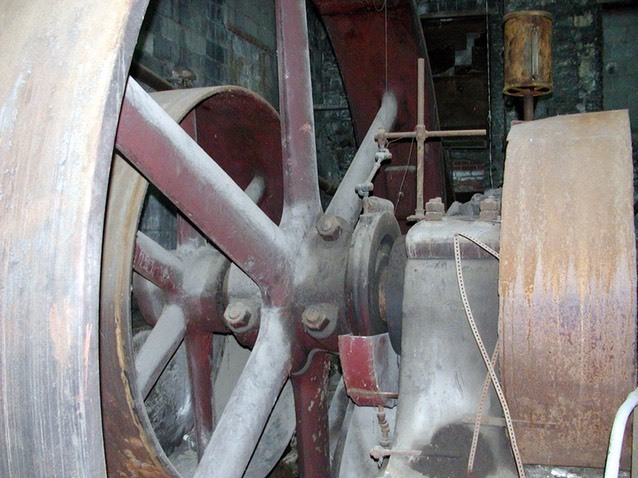 The 12' 6-spoked flywheel and the smaller 6' drive pulley still had the original red paint on them. Remnants of white stripes are visible on each spoke. The engine was lubricated by a gravity-fed gang lubricator made by the S.F. Bowser Co. The oil reservoir is the visible canister in the upper right of this photo. Piping carried oil from this canister to the various lubrication points on the engine. An end view of the flywheel. The flywheel pit had been used as a dump site over the years. 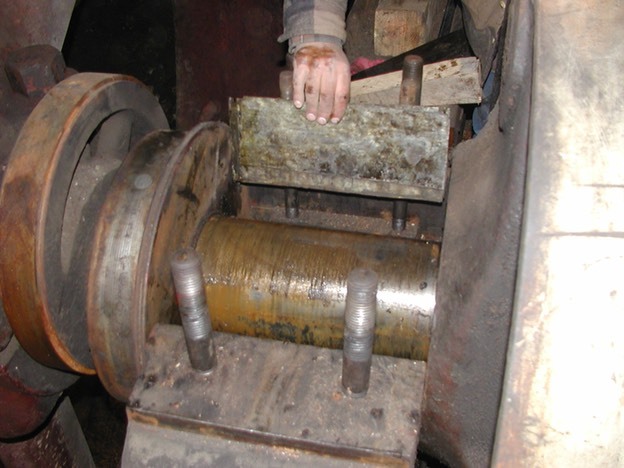 The bottom of the flywheel was covered with coal ash. There was 5 feet of debris in the pit consisting of ash, concrete, brick, wood timbers, and other items like shoes, cans, bottles and clothing. 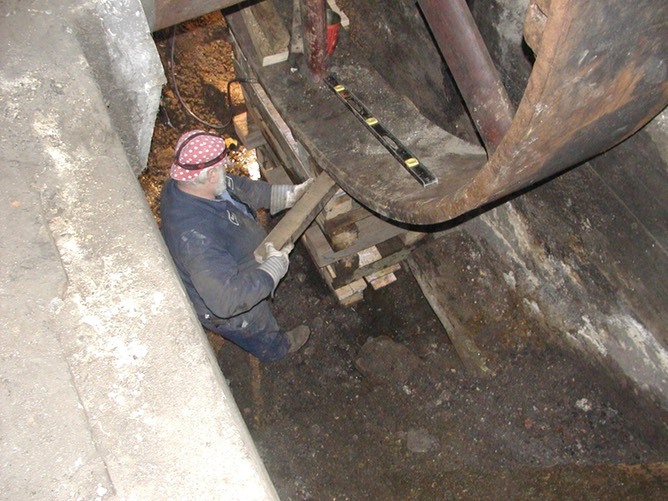 The flywheel had to be supported from the bottom during disassembly so the pit was dug out by hand to find a solid footing for the cribbing. This photo of the centrifugal flyball governor shows the only missing part on this engine. One of the flyball mechanisms is gone. 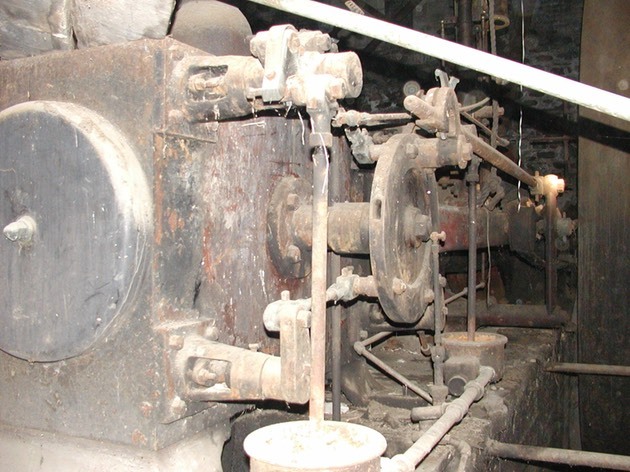 The relative completeness of this engine is likely due to the fact that it sat in a part of the mill that was no longer in use. Behind the governor, an ~500 gallon rectangular water tank sat next to the main cylinder. This had to be moved to gain access to the engine. A view of the outside of the Lafayette Paper Mill. The engine was located in a building-within-a-building. 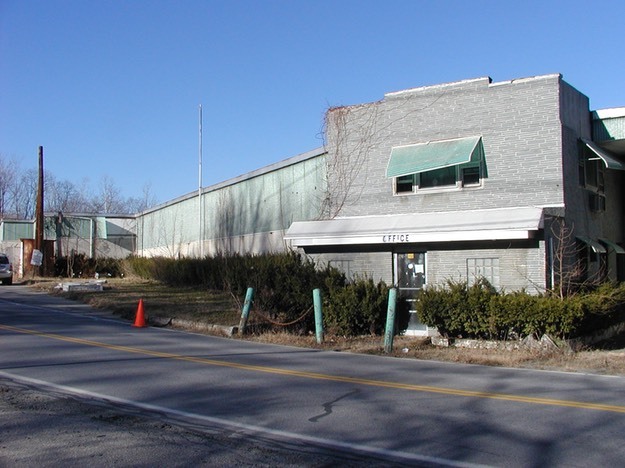 This circa 1950s corrogated structure was built over and surrounding the original stone and masonry mill built in the early 1900s. The entire mill is scheduled for demolition. 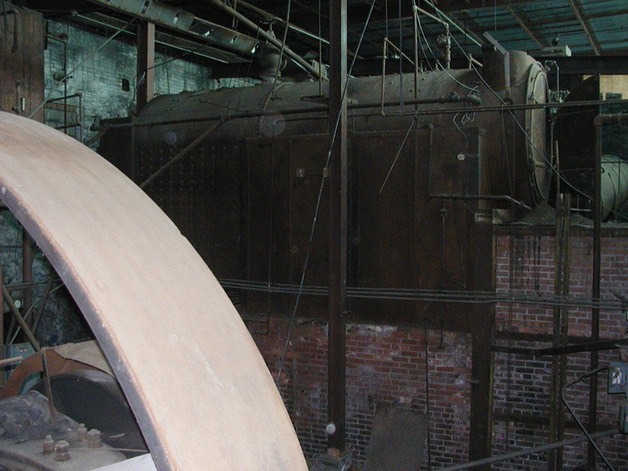 One of the huge paper-making machines located in another part of the mill. These huge drums were steam-heated. 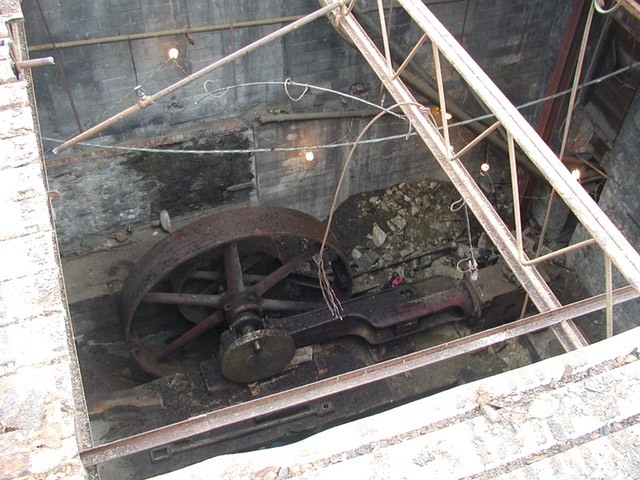 The Lafayette Paper Nagle-Corliss engine sat 15 feet below the nearest parking area. 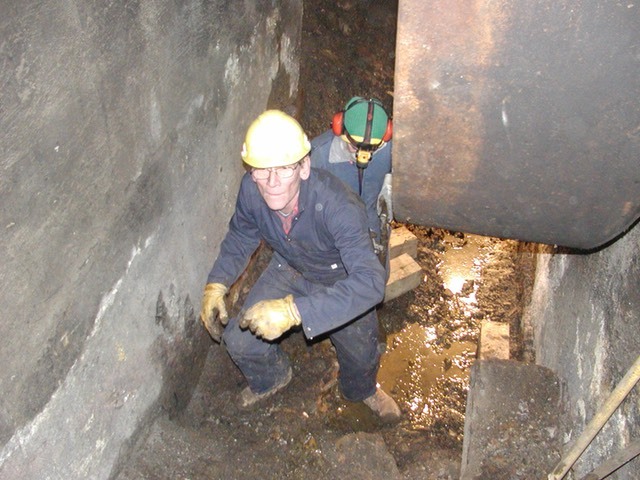 The CAMA volunteer crew had to bring in electric power and compressed air to an area that was only accessible by ladder. All tools had to be carried down the ladder or lowered by rope and pulley. A hole in the wall nearest the generator and compressor was jackhammered so air and electric could be passed into the engine room. Ray deZara carefully planned out the entire process of preparing the engine for removal. The basic steps to be carried out were as follows: 1) Clean out debris surrounding the engine to expose the engine and make for safe working conditions, 2) remove all small parts from the engine for separate packing, 3) disconnect the main and valve timing connecting rods, 4) disassemble inboard and outboard main bearings, 5) loosen bolts holding the flywheel halves together, 6) jack up the flywheel/crankshaft assembly to separate from the engine frame, and 7) release the engine frame from it's concrete and grout foundation. A lot of overhead steel and iron debris had to be removed to clear the engine for removal. This large I-beam was directly over the engine. The beam was cut and let down to the floor using cables and pulleys. The obstructing I-beam being gently let down from the ceiling after being torched at both ends. Part of the disassembly process involved taking the weight of the flywheel, pulley and crankshaft off of the engine frame. 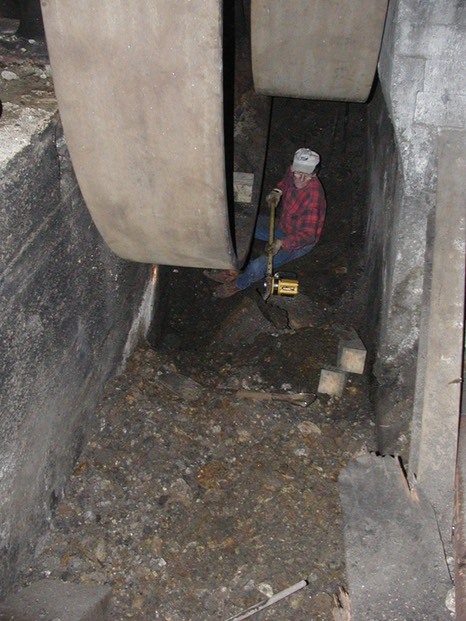 All the debris in the flywheel pit had to be dug out by hand to reach a solid floor on which to build a cribbing pile. In this photo, much less than half of the coal ash, bricks burned wood and other junk has yet to been removed from the pit. 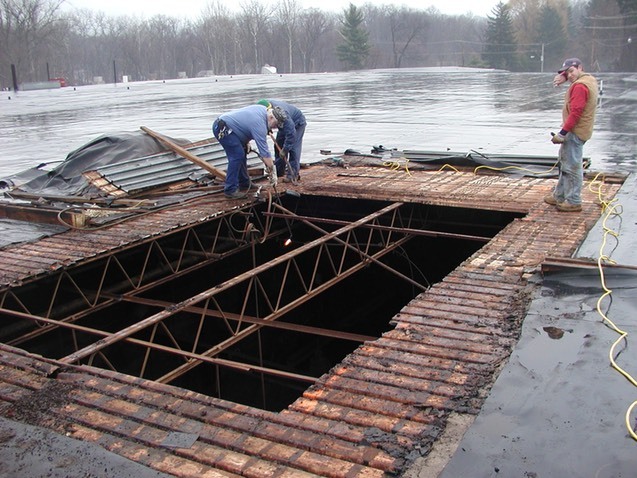 In the end, about 6 feet of debris had to be shoveled out of the pit. 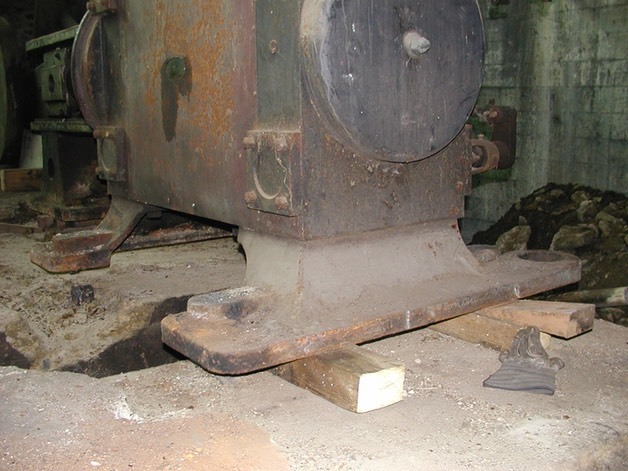 In order to lift the flywheel, a cribbing pile had to be built up under it. This cribbing had to be on firm footing to hold the ~8 ton weight of the flywheel/crank assembly. 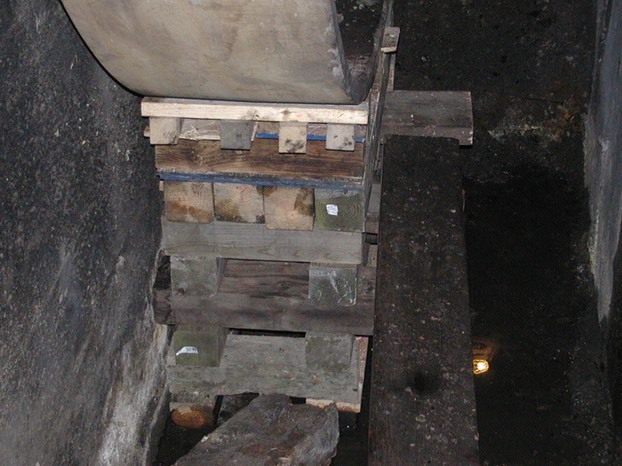 It was attempted to build a cribbing pile on what appeared to be compressed debris, but the extreme weight of the flywheel made this too risky. In this photo, not all the debris is yet removed. 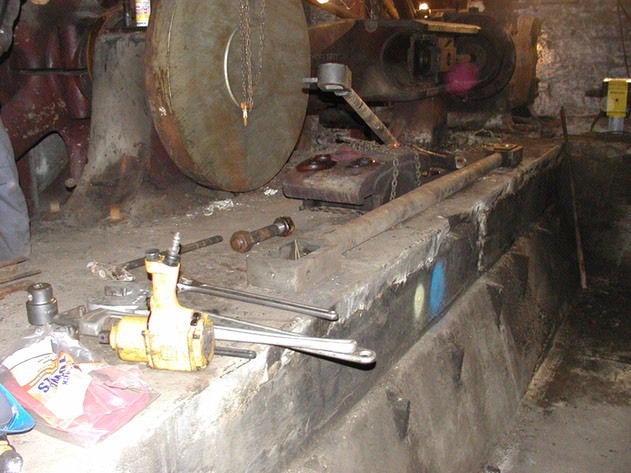 This photo shows some of the small parts (connecting rods, main bearing cap, etc) that have been removed from the engine. 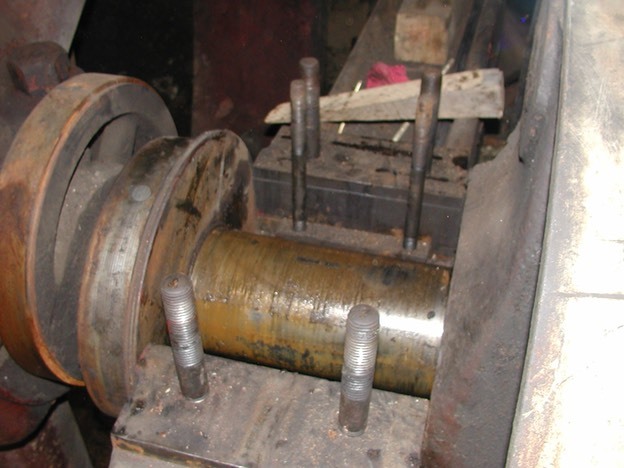 The bolts holding the flywheel halves together had to be loosened. The bolts on this side were particularly stubborn since they were buried under the coal ash in the pit. 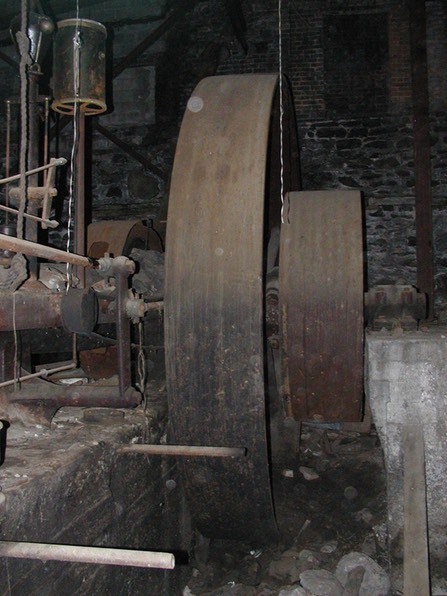 The flywheel had to be turned using a come-along until the halves of the flywheel were at top and bottom. A view of the inboard main bearing assembly after removal of the bearing cap. A view of the engine as disassembly work proceeds. Back down in the flywheel pit, groundwater has begun to seep in but the concrete floor of the pit has been reached. Now, with a firm footing for the cribbing, a pile is built, centered under the flywheel. To lift the flywheel, a 30 ton capacity airbag is used. The airbag is placed between the cribbing and the flywheel and inflated with compressed air. This lifts the flywheel about two inches, enough to insert wedges. The airbag is then deflated and the flywheel/crank assembly now rests on the cribbing pile, free of the engine frame. Another view of the inboard main bearing with the crankshaft now lifted clear of the engine frame. All grout surrounding the engine frame is now jackhammered free to expose the base of the engine frame. A good view of the 4' tall cribbing pile supporting the full weight of the flywheel/pulley/crankshaft assembly. 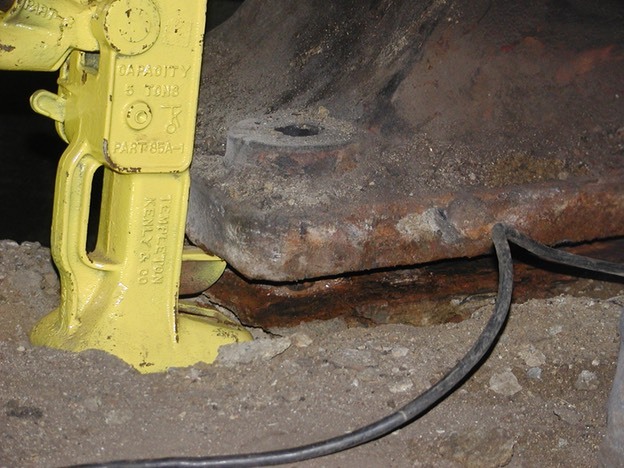 Now, using a combination of mechanical and hydraulic jacks, the engine frame can be broken loose of the remaining grout and lifted free of the foundation. With the grout removed, the bolts that held down the engine frame can be torched. A good view of the engine frame "floating" on wood blocking and free of the concrete foundation. 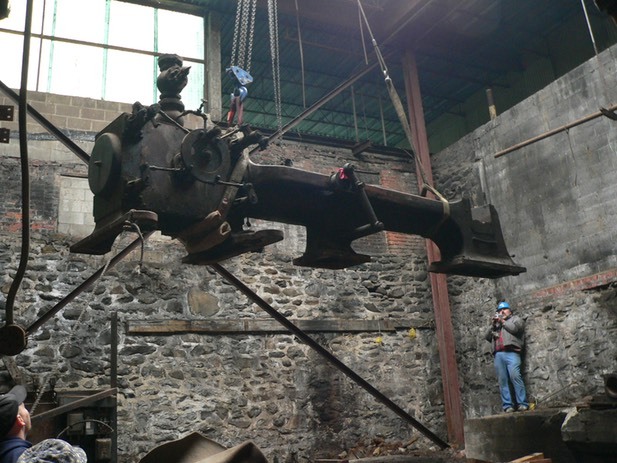 It was a dirty job, but with Ray's careful planning and the hard work of dedicated volunteers, the engine is now ready to be lifted out of the building. All of the work described on this page was carried out in three weekends! Ray deZara, Jim Anderson, Jim Daly, Trevor Marshall, Pat Moran, and Todd Syska. 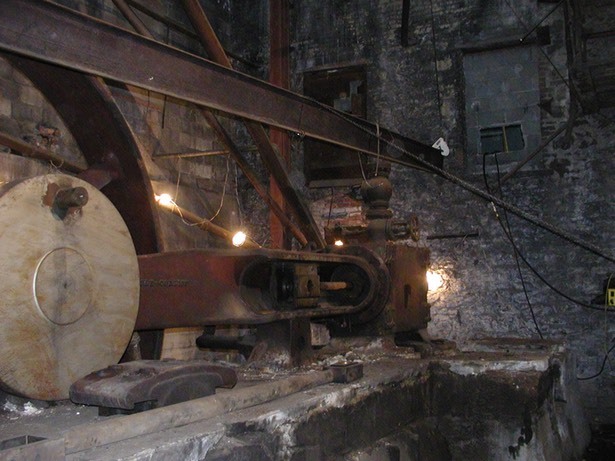 In order to lift the steam engine out of the building (the pick), a hole had to be cut in the roof over the engine. The hole had to be large enough for the frame to fit. 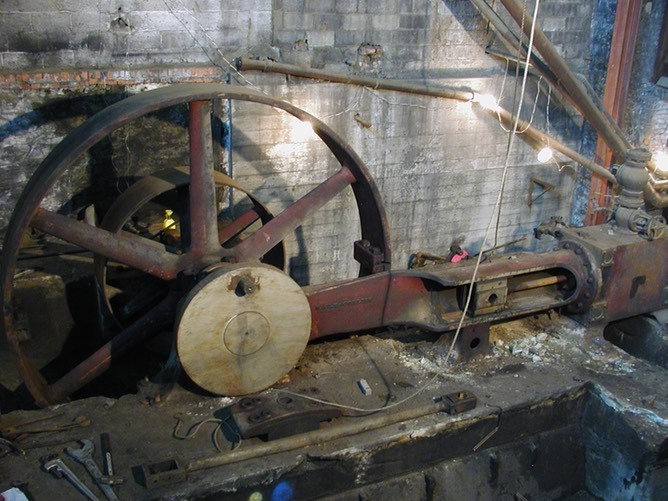 The hole was centered over the flywheel, meaning that lifting the flywheel halves and the crankshaft would be a straight, centered pick for the crane. This also meant that the engine frame, the heaviest piece was NOT centered under the hole. 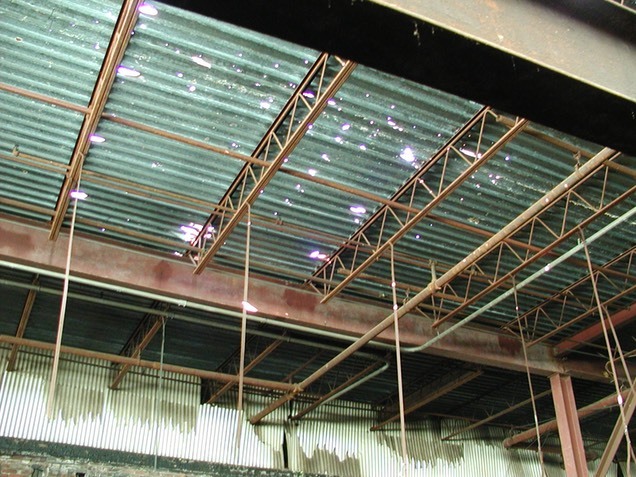 The roofing is a corrogated steel over trussed space girders. 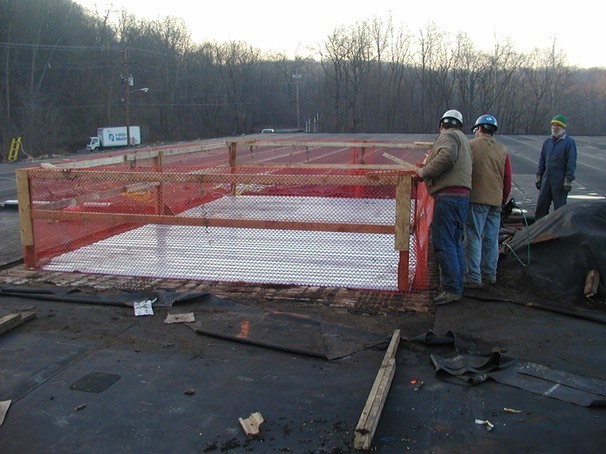 On top of the steel lies a layer of fiber insulation and a rubberized membrane. The heaviest piece of of the engine is the main frame at about 8 tons. 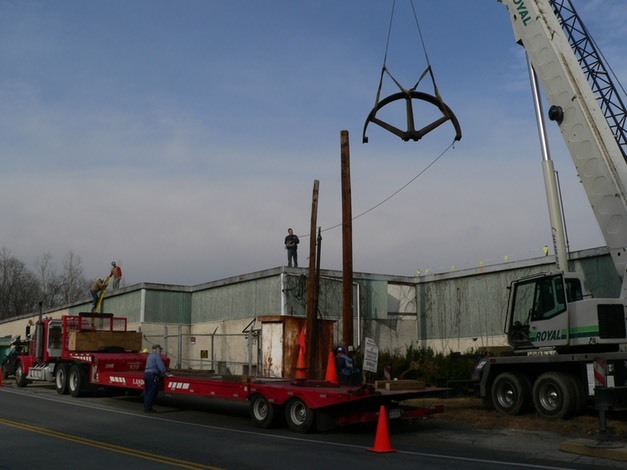 A crane can only get to about 35 feet from the opening in the roof, so a 60 ton crane was needed to lift that much weight at that distance from the crane. John and Michael Luchesi and a crew from Barrett Roofing volunteered time and materials to remove the old roofing, stripping down to the steel a few days before the crane was scheduled to arrive. 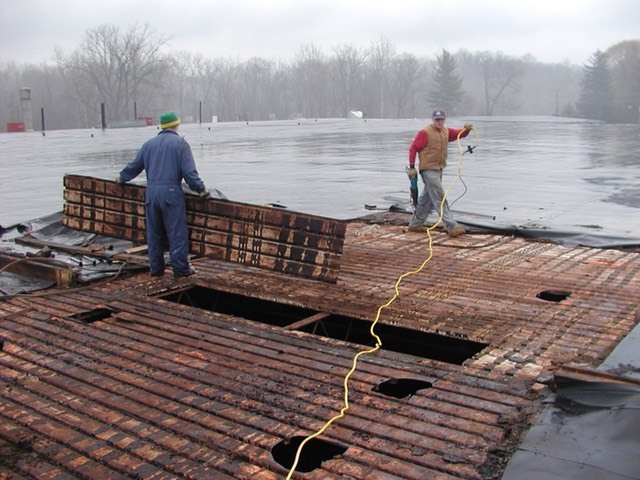 CAMA volunteers assisted in removing the roofing. The corrogated metal roof from the inside. The area marked with the large holes is the roofing to be removed. The middle section of girder must also be removed. Everything is now ready for the crane and the pick. 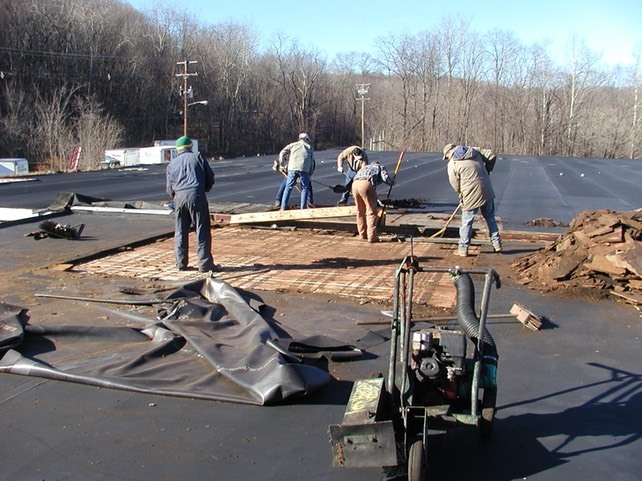 The roofing is left in place as a safety measure. 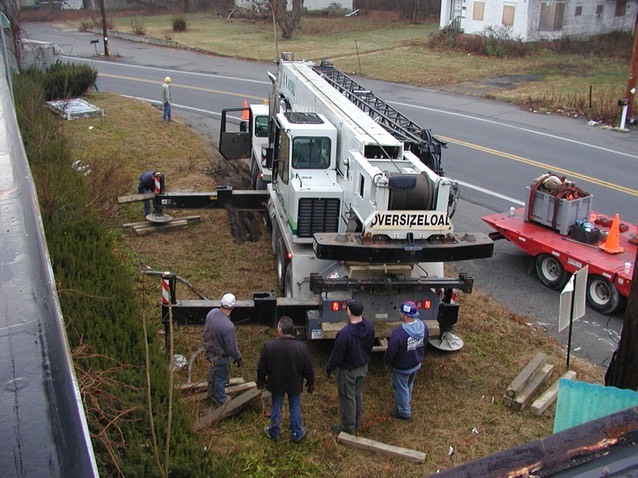 On Saturday morning (Dec.15, 2006), the day of the pick, the corrogated metal roofing is removed using a Saws-All to cut through the rusty steel. 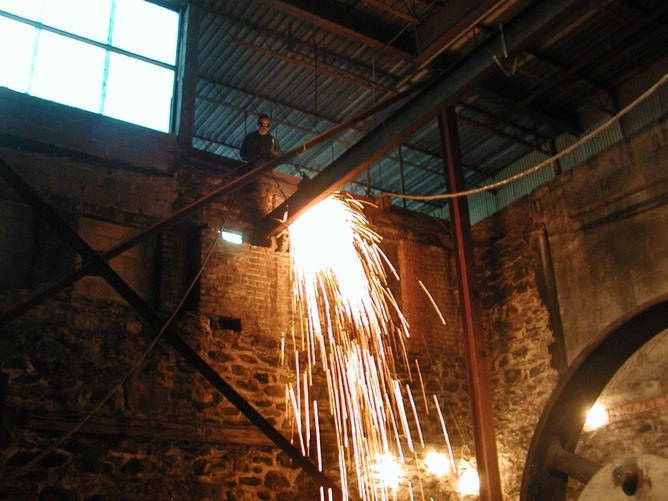 Once the roofing is off, the various angle iron and barstock pieces spanning the hole are torched. The central girder awaits the crane to lift it out after cutting. A view through the hole down into the engine room reveals our prize. The Arnoff/Atlantic Coast Moving & Rigging crane arrives on schedule. 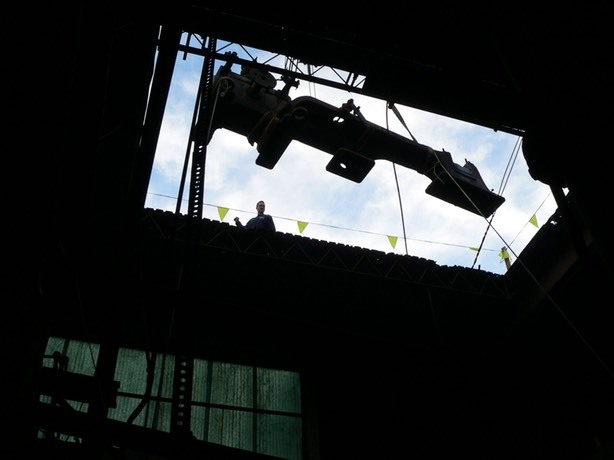 After setting up, the crane is first used to lift replacement steel roofing to eventually re-cover the hole. The crane is then used to lift out the center girder shown in previous photos after Ray cuts it loose with the torch. 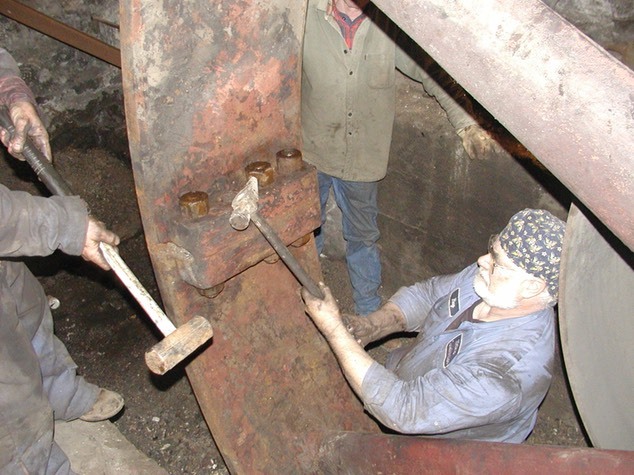 The riggers from Atlantic Coast prepare the top half of the flywheel for the pick. 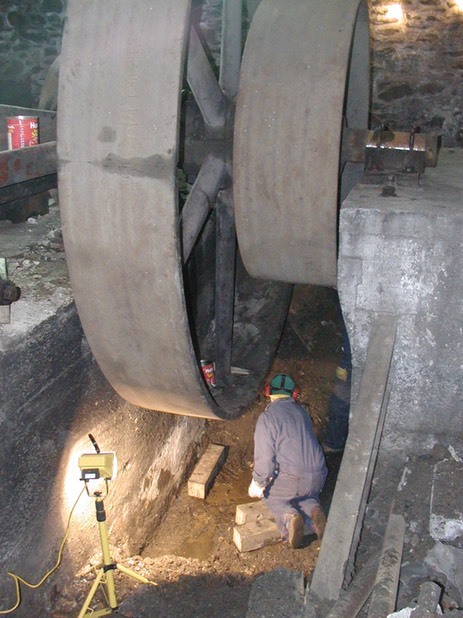 Once the top half of the flywheel is secured with straps, the bolts holding the halves together are removed. The piece is soon up and on its way to the flatbed trailer. The flywheel in the air with the awaiting flatbed trailer in the foreground. Next to be lifted out is the crankshaft/pulley assembly. 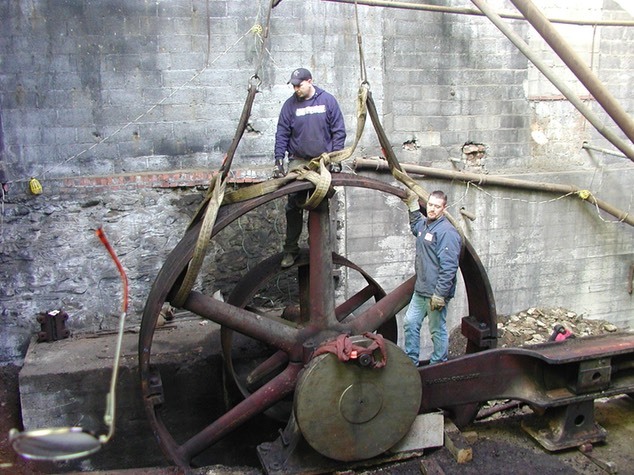 Now, the lower half of the flywheel, previously supported on the wood cribbing, is lifted out of the engine room. 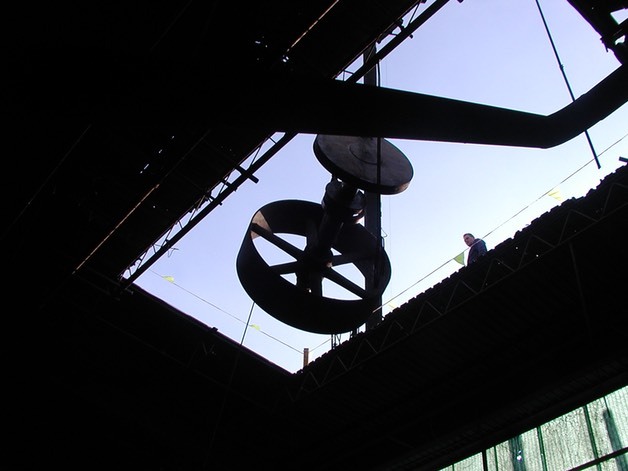 The engine frame is not centered under the hole in the roof, so a combination of a chain hoist, strapping and and heavy duty rollers (the red items under the pedestal of the frame) are used to carefully roll the frame under roof opening prior to lifting. Now centered, the crane can pick the engine itself. Note the chain hoist used to level the engine during the lift. The ~8 ton engine frame appears to be floating over the hole in the roof. The engine frame is set down on the flatbed along with the other parts of the engine. 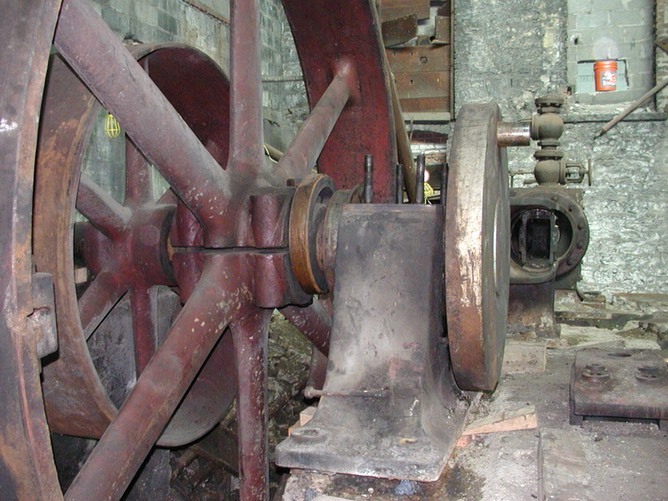 The flywheel halves are visible to the left. 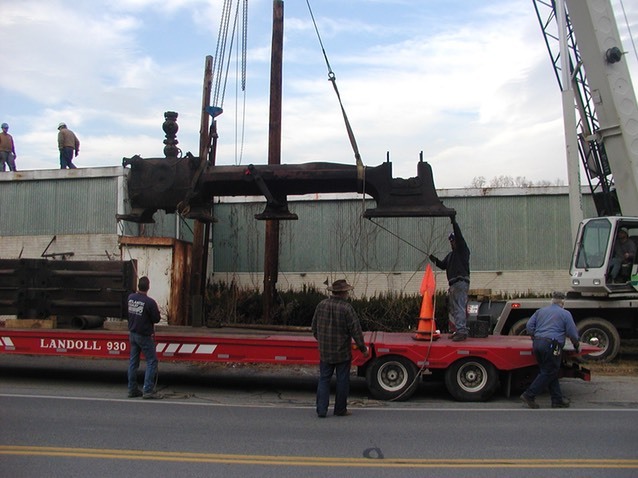 The crankshaft is the last piece of the engine to be placed on the flatbed. The pieces are all securely strapped down for the trip to Kent on Sunday. The final step on Saturday is to police the worksite, and close the hole in the roof to prevent unintended injury. Even though the mill is scheduled for demolition, CAMA was committed to making the work site as safe as possible to prevent injury once we have left.